I had the pleasure of meeting Matt Bellisle a few years ago and for some time he’s been sharing his cool ideas for a unique folded comic book called Tetherman, and it is coming out soon! Read an interview I did with him below and check out his Kickstarter fundraising campaign to support the book and purchase a copy here. 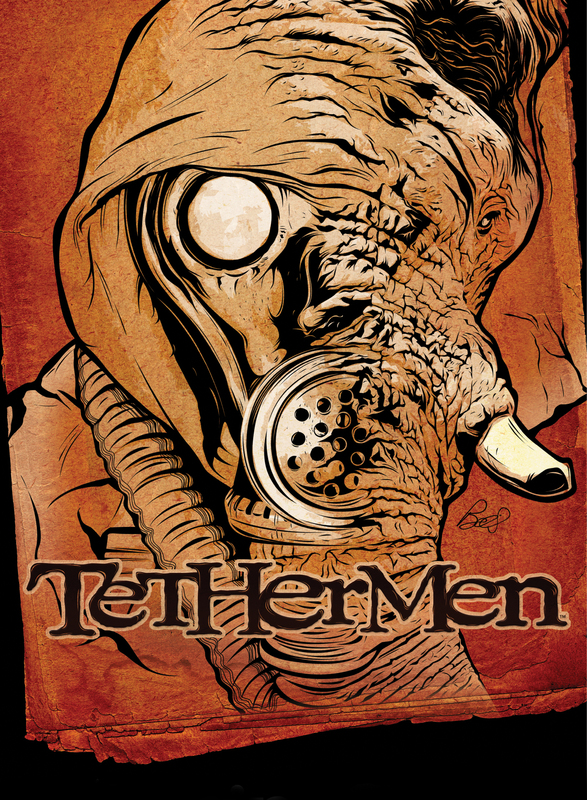 Tetherman is a new comic book you are collaborating with Chris Garrity on, tell us what it is about? 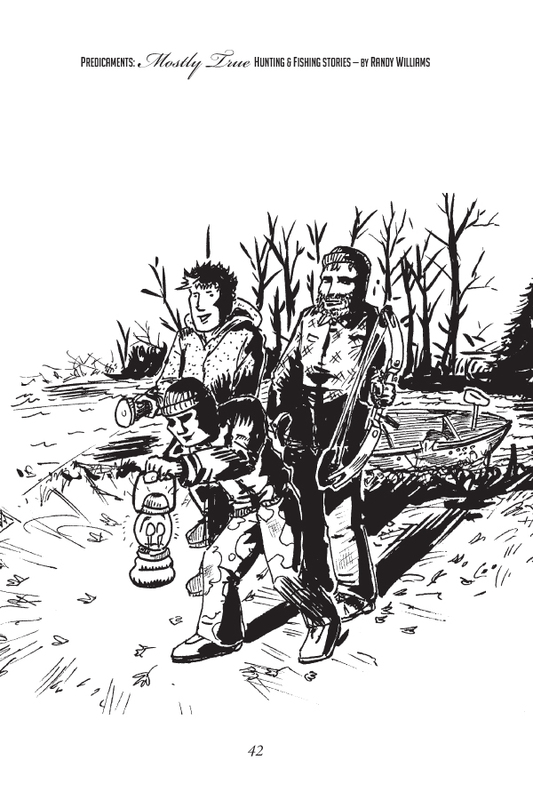 MATT BELLISLE: The Tethermen is a book I’ve been cooking up for a few year’s now. It’s about a group of individuals who can travel within the dreamscape that we all sleep in… That shared dreamscape is an energy field we all share and reside in when we sleep. These people, the Tethers, can not only access their own dreams, but those of others and literally jump from one dream to another. Like anyone with power, some of these people become corrupted and start to use this for unsavory means. So when we join the story, there is about to be a war between these forces within the dreamscape. The format for Tetherman is quite different, what led you to create a folded, poster sized comic book? MB: The book is unique in that it isn’t presented in a standard paged book, but opens up into a giant poster. When you see the book on the shelf, it looks like a normal comic, but when you open it, it unfolds like a map, into a large-format poster. I’ve been doing self-published books for years and I’ve always played around with goofy formats, no two ever being the same. But since those were always just put together with laser prints, they were always small. So when it came time to do this project, I wanted to step out of that mold and do something just the opposite and do a large format comic. That’s where I brought in my good friend and amazing artist, Chris Garrity. We both are big comic guys, so we came up with a way to each do our own series, but collaborate at the same time. What we are doing is each taking a different side of the poster/book. My side is the Tethermen, and his side has his own creation, the Neolithics. 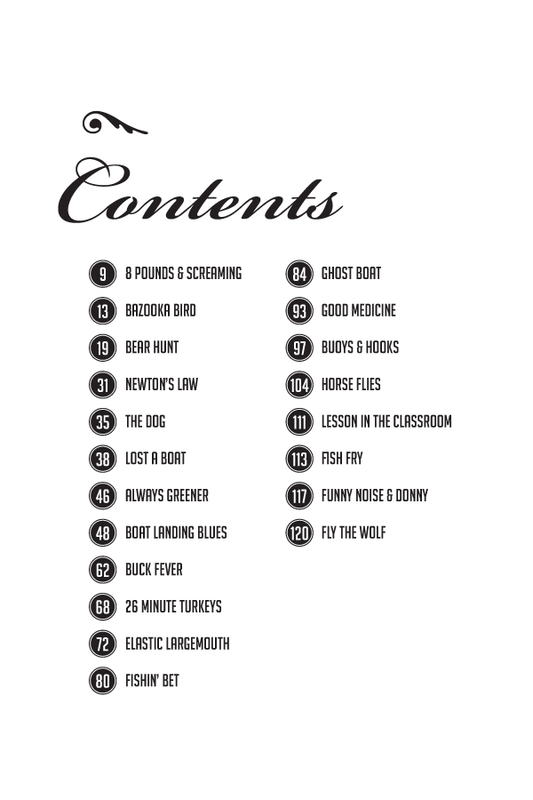 Our hope is that the book will be successful enough for us to put out at least three of these. While both stories are separate from one another, we are planting clues between the two stories that will eventually lead to them being part of one larger story that interwinds between the book. You have a very detailed drawing style. What is your illustration process; photo reference, digital inking, drawing tablets? MB: Both of our stories are a nice contrast to one another in tone and style. Chris’ style is much more traditional comic-styled with roots to Geof Darrow or Moebius, where mine is a much darker photo-referenced look and probably inspired by guys like Tony Harris or Tim Bradstreet, more than anyone else. I now do all of my art work right in Photoshop, where I’m essentially drawing right over the reference shots I take for the characters, which are typically friends and family I bribe into posing for shots for me. As well as a talented comic book creator/illustrator were the Creative Director for Spark Advertising, President of AAF Fox River Ad Club, and recently struck out on your own forming the graphic design firm GravityDSN and freelance illustration work – what am I missing? MB: I think both the book’s format and visual style is a product of my day job, being a Creative Director and Designer for a design firm. I had been working at advertising agencies as a Creative Director or Art Director for over 15 years and just recently decided to quit working for “the man” and start my own company. The new firm, Gravity DSN is a place where I’m still focused on designing and working with branding work, but can also add illustration and comics to the mix. So with that, I can now focus a bit more on the comic work and make that a part of the company’s workflow, as opposed to working on the comic after hours when the rest of the family was in bed. What are some projects you have coming up? MB: We are a bit behind schedule, but we have now released Tethermen to the world via Kickstarter.com. The link to our Kickstarter project is here. We continue to see great and not-so-great stuff get funded and supported through that site. It’s such a great opportunity to show a large amount of people your work and have then support you to make it happen. 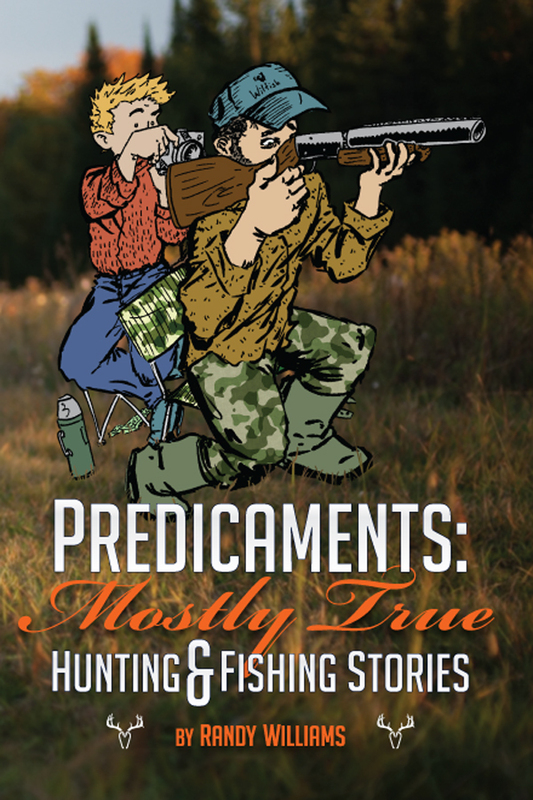 If all goes according to plan, we plan to “release” the book to the public at the 2014 C2E2 in Chicago. We also plan to self-distriubte the book through our own website and bypass the traditional distributors. It will be more work for us, but we feel the best part of the comic scene is the “community” and for us to talk to people in person or send them copies ourselves for review just seems more personal and connected to our peers. 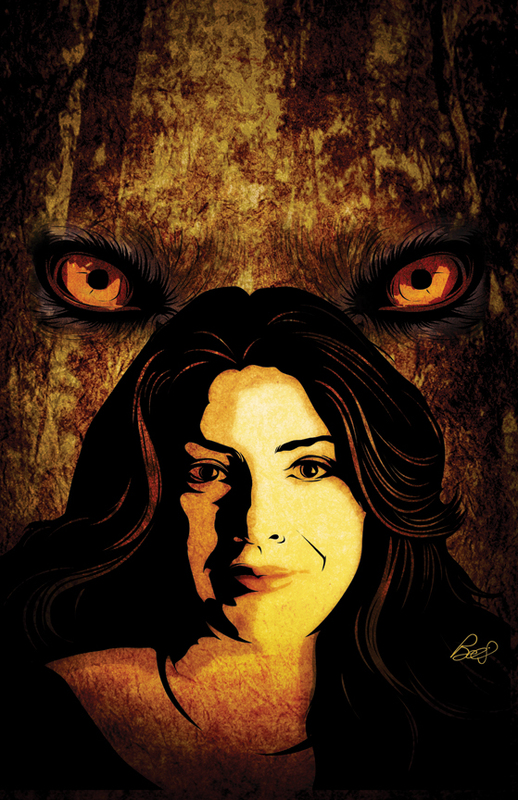 Bluewater Productions has had the pleasure of using your illustrations on several covers and some internal art. What can you tell us about working with them? MB: The last few years also saw me doing a number of freelance comic projects with Bluewater Productions out of Washington state. I started doing some work for them several years ago on some spec covers for a Battlestar Galactica pitch they were doing. 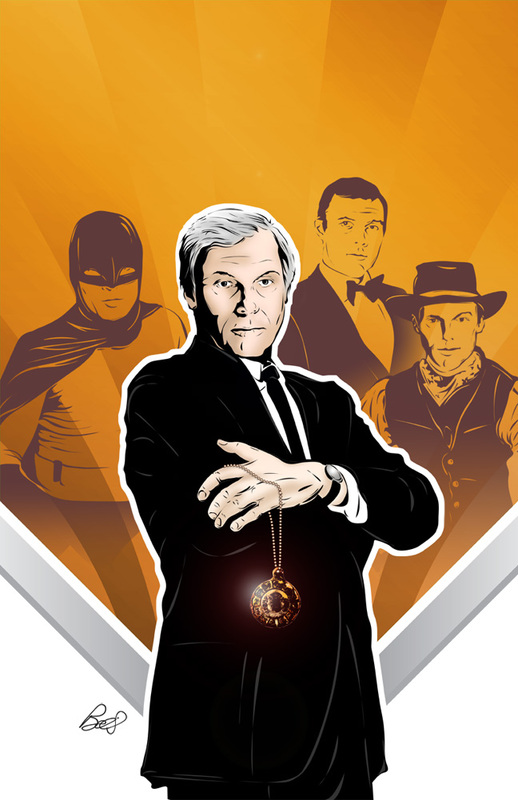 That fell through, but the strength of those concepts lead to me working on the covers for Bluewater’s Warlock, The Misadventures of Adam West, Logan’s Run, Fame: David Beckham and Female Force: Stephanie Meyers books. I also did a few interior pages for them in the Vincent Price Presents and Stephanie Meyer deluxe edition. A lot of people complain about their payment structure, which is not built to favor the creators, but despite not really getting paid for that work, it was a good experience for me and I had a lot of work published that I wouldn’t have had if they hadn’t given me the chance. What direction do you see comic books moving in? I also think comics are going to continue to be a medium that grows, but in a more underground way. I think Marvel and DC have taken the superhero genre about as far as they can and readers are reacting to that by trying more and more independent comics that have nothing to do with capes or super powers. Those are the types of comics that I see taking the comic-scene forward. I think there will always be a market for the Superhero books, but I hope the indy scene can grow to new heights. MB: Loving the new Prophet series from Image, as well as RASL and Rachel Rising… I tend to get the Image and other independent stuff and shy away from Marvel and DC. Thank you Matt, best of luck with all your creative endeavors! 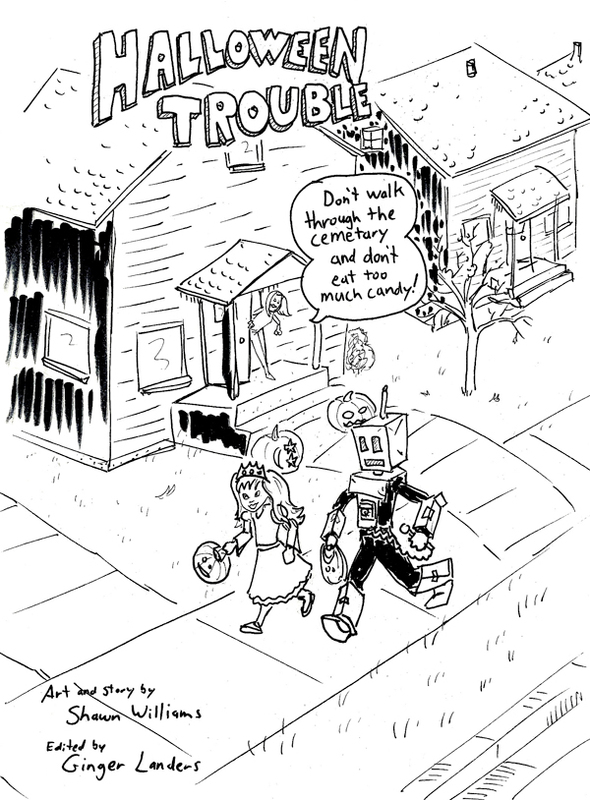 For Halloween I wrote and drew a short 8 page minicomic to give away at trick or treating. Ginger Landers edited and distributed it while Batgirl and I gathered candy! 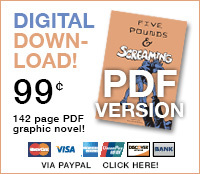 Anyway, if anyone would like to just read the comic here is a reading PDF. If anyone would like to try to print off their own – download the collate-able PDF version. Print page 1 of the PDF with page 3 of the PDF on the back of that sheet of paper. Then print page 2 of the PDF with page 4 o the PDF on the back. side. Order them with the comic page numbers printed on the 4 sheets (the comics pages are numbered 1-8) and fold them all in half, staple if you’ve got one and you’ve got a unique Halloween giveaway! – OK, I realize printing out the collate-able comic probably sounds a little confusing, but here is what I recommend doing and it should work for most desktop printers. Download the collate-able PDF version. Print pages 1, and 2 of the PDF. when the 2 sheets come out of the printer flip the order in which they lie. Top sheet to bottom, bottom sheet to top. (Do not spin them, do not flip them upside down.) Then put the 2 sheet back into the printer as they are now. Then print pages 3-4. They will come out printed correctly and you just fold the sheets in half. Good luck! 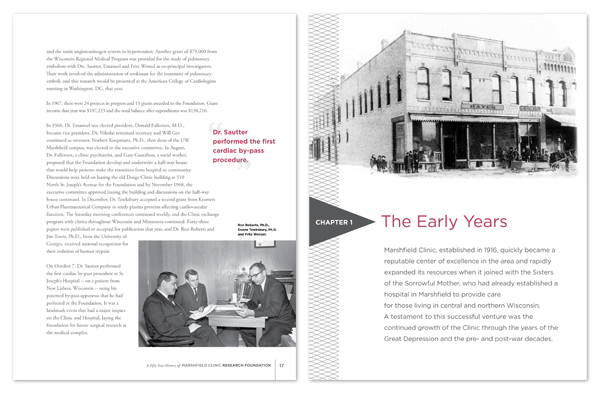 A Fifty Year History of Marshfield Clinic Research Foundation, as the title suggests, is a book about the entire 50 year history of the Marshfield Clinic Research Foundation. It is authored by Dr. Joseph Mazza, with input from Dr. Barbara Lee and librarian Alana Ziaya who collaborated to create the 52 page book. With direction from the rest of the Creative Services group and from the writing and research team, I designed the book and helped make both softcover and Kindle versions available to the public on Amazon.com . There is great photography in the book from years of research, education, medical innovation, farm medicine and more at the Marshfield Clinic. 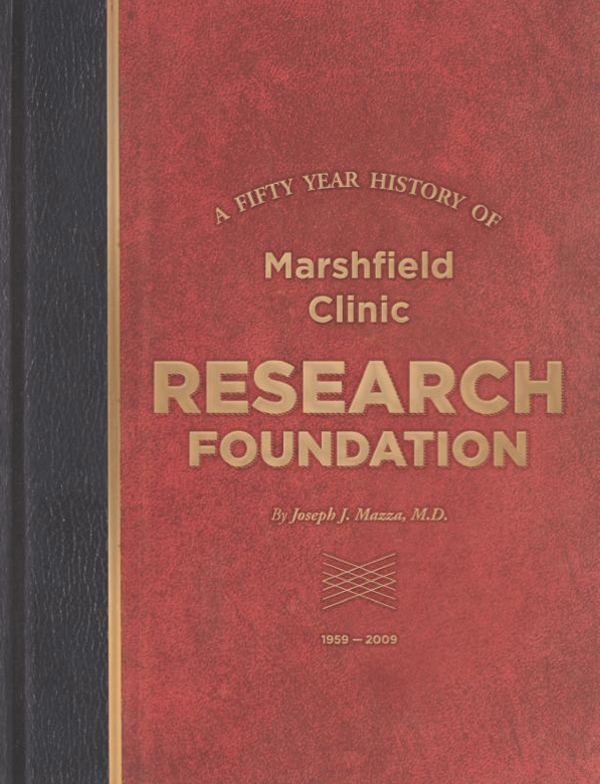 Some revolutionary inventions and discoveries in the Marshfield Clinic Research Foundation are documented in the book as well. I’m proud to be a part of this book team and pleased to see how well it is being received. My 9 year daughter and I made a short 7 minute film recently called Lost & Found Animals. She wrote it, and we both starred and acted in this fun, funny movie. We shot it on an iPad Mini and edited it in Photoshop. Here is a poster I designed for a dinner/play performance of The Fox On The Fairway. Shows are in October 2013 at the Shamrock Heights golf course, in New London , WI. To learn more about the Wolf River Theatrical Troupe see their Facebook page here. I worked with author John Jackson Miller for several years at Krause Publications on the late Comics Buyer’s Guide magazine where he was an editor for many years. John went on to write several comic books (Iron Man, Simpson’s, Star Wars: Knights of the Old Republic, Mass Effect, Indiana Jones, etc.) as well as many novels. He recently wrote a prequel to his ongoing sci-fi Overdraft series story called Human Error that I helped design the cover for (above). Much of the trade dress design was already established and much of the imagery was chosen, but I enjoyed doing the color correcting (it was eventually adjusted) , layout, and typography on this cover – and it was great working with John again. You can see more about John’s Overdraft series here. And you can see his best seller Kenobi, Star Wars novel here. And a link to John’s blog is here. 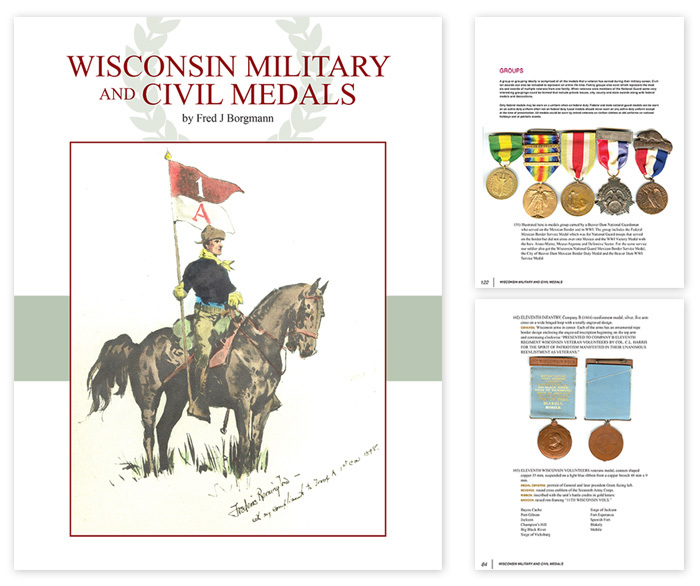 I was given an opportunity to layout and design the Wisconsin Military and Civil Medals book by the renowned coin and medals collector and editor Fred J. Borgmann. It’s a 176 page, full color book that is comb-bound so it can be left open flat for greater ease in identifying. There is really no other book of it’s kind like it. It’s interesting to see all the different, incredibly detailed medals as well as reading the Wisconsin cities and towns (Edgerton, Wauwatosa, Cadott, etc.) that issue them. There is an incredible amount of research and information that went into this book and I am proud to be a part of it. Email fredborgmann@yahoo.com for more information and about ordering it. 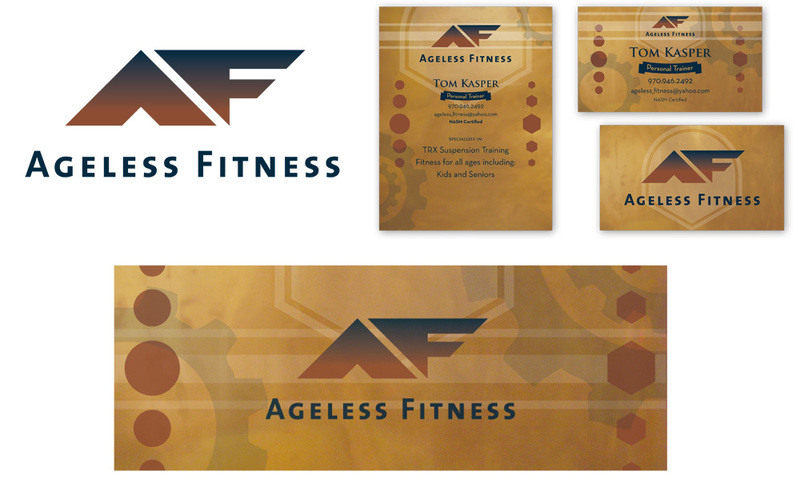 Ageless Fitness is a gym in Colorado (809 Park Street, Castle Rock, Colorado 80109) that asked for a logo and brand identity. This brand is strong. Ageless meaning both that the business has a lot of experience and it has been around a while, but also that it was a gym that any age and any gender should be comfortable walking into. I am showing here the logo I designed; as well as the business card, their Facebook cover and avatar, and their signage. Many of the design elements are based on dumbbells and free weights. 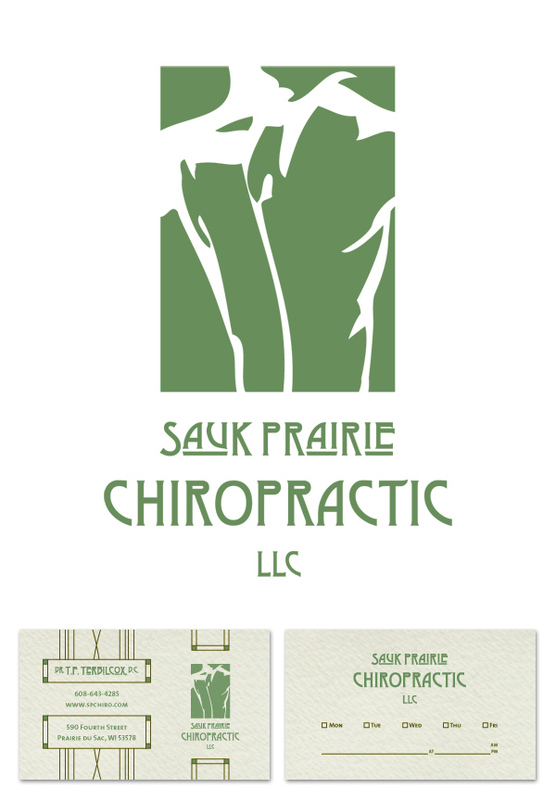 I was asked to redesign the logo and business card for Sauk Prairie Chiropractic a Chiropractic office in southern Wisconsin and here is their new Arts & Crafts movement inspired identity.